Kuala Lumpur, Malaysia -- Receiving ordination as a bhikkhu in Thailand, entails acceptance of the authority not only of the Vinaya, but also that of the Mahatherasamakom, (the Thai Sangha's governing body) and the laws of the land. The Wat Pa Phong Sangha considers as a matter of course, that all of its members are ethically bound to respect their commitments to the Mahatherasamakom and to the Thai State. Wat Pa Phong and its branch monasteries constitute an informal grouping within the Thai Sangha. Membership of this group is voluntary and dependent on a willingness to conform to certain broad standards, most of which were established by Ajahn Cha. They include dhutanga practices such as daily almsround and eating one meal a day from the almsbowl. Special allowances are granted for overseas monasteries and generally speaking, abbots are almost completely autonomous in the running of their own monasteries. However, in the case that a monastery develops practices that significantly deviate from the Wat Pa Phong template, the matter is raised at the annual general meeting in June. The abbot in question is interviewed and asked to choose between the unacceptable practice or exclusion from the group. This procedure was followed in the case of Ajahn Brahmavamso with a meeting held on 1st November. Exclusion from the Wat Pa Phong Sangha is primarily intended to maintain the harmony and integrity of the group. It is not a punitive measure, although in Thailand at least, exclusion may lead to a certain loss of prestige and material gains. Ajahn Brahmavamso is unlikely to be adversely affected by the exclusion. His reputation and fund- raising activities may well be enhanced. His social ties with Wat Pa Phong were already weak. He has neglected relations with his Thai colleagues for some time now. Over the last few years several of his trips to Thailand have been devoted to teaching laypeople without including visits to Ubon (most notably the one that coincided with the Wat Pa Phong annual general meeting of June 2009 in which the bhikkhuni issue was discussed). The most common view of the Western theras (elders) is that Ajahn Brahmavamso had agreed to host a 'World Abbots Meeting (WAM) in December in which discussion of the bhikkhuni question was on the agenda. If he had waited until that meeting, and after talking things through, announced his decision to leave the WPP Sangha in order to follow a path he felt deeply to be correct and noble, his actions would have been considered regrettable but honourable. In planning a bhikkhuni ordination for a couple of months before the WAM was to take place, in concealing his plans until a week before the ordination, and in carrying out the ceremony without speaking to either his preceptor, Somdet Buddhajahn, or the leader of the WPP Sangha, Luang Por Leeam beforehand at all, he acted in a way that suggested deceit and disrespect. For most of the Wat Pa Phong theras, the intellectual argument over the validity of bhikkhuni ordination is not the point. Their lack of knowledge of the latest studies on the subject is, in their eyes, irrelevant. 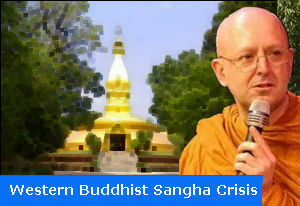 To them the issue is that Ajahn Brahmavamso reneged on commitments implicit in his ownership of a Thai monastic passport, his role as abbot of a Wat Pa Phong branch monastery, his position as an officially sanctioned preceptor, and his acceptance of the Jow Khun title (formalizing his membership in the elite strata of the Thai monastic order). In the meeting of the 1st November it was the perception that Ajahn Brahmavamso had acted disrespectfully to his teachers and lineage that aroused emotions, not his wish to elevate the status of women. Time only will tell if the bhikkhuni ordination at Bodhinyana monastery in October 2009 will be seen as a key breakthrough in the acceptance of a Theravada bhikkhuni order, or as an overly hasty and confrontational move that alienated many of those it was intended to persuade. Get Breaking Buddhist News in your Email. Free subscription.